The massive £1.6bn Clapham Park regeneration project in south London will feature 2,532 new homes, 53% of them affordable, spread across a 36 ha site located between the town centres of Clapham, Brixton and Streatham Hill. 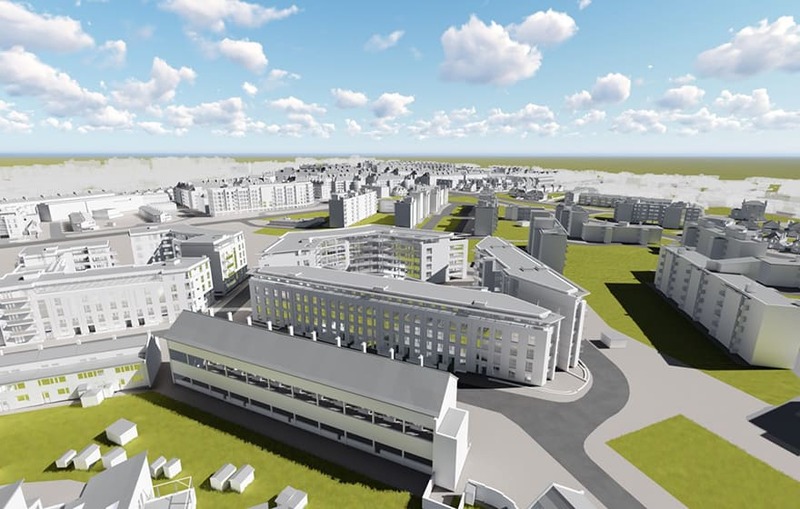 The scheme builds upon an existing masterplan, approved in 2008, for which 500 new homes have already been built and more than 700 refurbished to Decent Homes Standards. A raft of new facilities will include a community hub and public spaces, as well as a new underground utility network. Construction is due to start at the end of 2018. Staff at surveying consultancy Plowman Craven worked day and night shifts for several weeks to capture 3D data for an enormously detailed BIM of the existing site and buildings. This is being used by consulting engineer Ramboll, architects PRP and services consultancy Hoare Lea as the basis for all subsequent design development. A state-of-the-art drone and camera set-up was deployed to rapidly accelerate data capture, taking more than 20,000 high resolution images at low level in under a week. The huge site would have taken 10 weeks to survey using traditional methods. 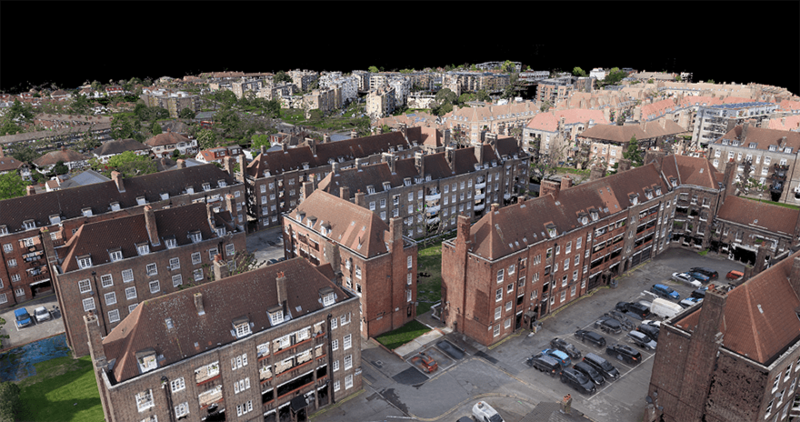 The UAV photogrammetry was combined with data from terrestrial laser scanners to produce colour 3D point clouds. These formed the foundation of the BIM, which was drawn manually by five teams of three individuals at Plowman Craven over a three-month period. The extremities of the site were modelled to level of detail 1 (LOD 1) and only include building massing. The facades of around 400 buildings were built to BIM Level 2 and LOD 3 or 4 and include highly accurate representations of windows, doors and cladding etc. Classification (Uniclass2015) and naming in accordance with BS 1192 and BS 8541 will enable more versatile and controlled model management. A volume strategy was applied to the delivery of the BIM model, in accordance with PAS 1192-2, to break it down into 35 separate manageable chunks. This staged delivery helped improve visibility and de-risk the project, says Gregory: “Scanning the critical areas first we could build and deliver those models then switch attention to the less important areas at a later stage. “The lean approach helped us reduce the data weight of models, giving designers the capacity to subsequently add in lots of design data without them becoming unwieldy,” he concludes. This is a nice case study. We have been developing 3D Models in our shop for clients and increasingly have been asked to combine those design models with actual drone captured data to build the database for eventual BIM systems. We have also seen the BIM using the design models to support targeted building exterior inspections using drones. The precision construction world has gotten a lot more interesting with the introduction of these new technologies.